There’s been jazz at The Verdict for just over three years – all thanks to proprietor and promoter Andy Lavender. Friday is the night when the cream of British and International jazz can be heard in the cosy basement of this trendy café, just a few hundred yards from the seafront. 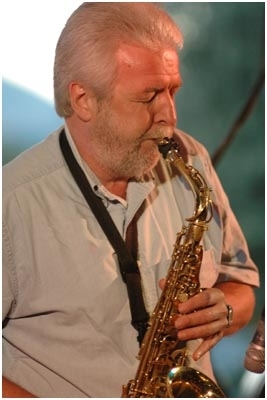 Brightonian Simkins is one of the UK’s finest alto saxophoinists, very much in the Lee Konitz mould. His sound is pure and lovely, his execution clean and immaculate. He extols the virtues of post-bop West Coast “cool”. He never over-blows and doesn’t over-solo. Coltraneish “sheets of sound” and Ornette free-blow are out of bounds for this player. Instead, everything is beautifully relaxed and lucid. The gig was a joy, due in no small measure to Simkins’ inate ability to transmit his musical bonhomie to the very hearts of the listener. He was aided and abetted by a first-rate rhythm section, Williams, Woolf and France supporting the altoman impeccably throughout. The repertoire comprised well-known standards: “How Deep is the Ocean?”, its melody cleverly disguised initially, Gordon Jenkins’ poignant ballad, immortalized by Frank Sinatra – “Goodbye”, a breakneck “Cherokee”; a couple of Earl Zindars waltzes, “Elsa”, “Sareen Jurer” (Zindars wrote some wonderful tunes, one of his biggest advocates being Bill Evans); a Monk ballad (“Ask Me Why”); a Lennie Tristano offering (“Lennie’s Pennies”); a brace of Konitz tunes (the finger-busting “Friend Lee, based on the chord sequence of…you guessed it, “Just Friends”, and a groovy blues, “Cork and Bib”) plus a boppy Simkins original (“Don’t Ask”, based on the chords of “How About You”), the inevitable encore, Jobim’s languid bossanova “Intuil Paisagem (English translation “If You Never Come To Me”), the only Latin-inflected number of the evening. One of the glories of the night was Williams’ piano solos. Steeped in the modern language of Tyner, Hancock and Corea, he wowed the audience with the volcanic power of his improvisations. When Woolf was not soloing impressively with both finger and bow, he provided a rock-solid foundation for Simkins’ and Williams’ musical forays, France swinging and grooving in the mid and up numbers, creating delicate soundscapes in the ballads. It was a wonderful session infront of a jam-packed audience. Everyone left with sunny faces, broad grins and a lightness in their gait. I look forward to returning to this delightful venue in the not too distant future.